New design! Reseal's most common food and pet food cans from 3 Oz. to larger family-size cans. Features a convenient pull-tab for easy removal. Top rack dishwasher safe. 3 3/8" Diameter x 1/2" D Minimum pieces: 250. Production time is 5 working days after art approval + shipping transit time. Please leave a telephone number in the event of an email failure or we may not be able to contact you. 250 - 499 Pieces @ .61 each. Please enter a number from 250 to 499. Enter a quantity between 250 and 499. If more than 499 is needed, please call and we will send you a quote. Choose an imprint product color. White works best for most dark color lids and black for most light colors. If you need a color not shown below, please put in the notes and we will contact you. If this order is not shipping to Texas, select NO or you will be charged sales tax. I need to provide additional information. 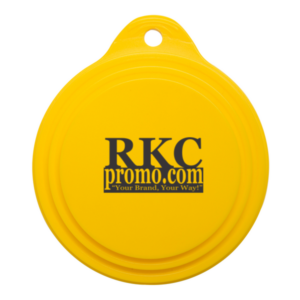 Please provide more information about your promotional event for this product. Please include quantities, event dates and other pertinent information. Accepted file types: jpg, eps, png, pdf, ai, psd. Please supply a telephone number. If we cannot contact you via email, we may contact you via email to verify your request.